No one wants to be a people pleaser. But could you be one without even realizing it? If you feel more significant and more important to others when you have more responsibilities on your plate, then you’re not alone. You’ve joined the ranks of the people pleasers. Busyness is today’s badge of success. And if you can’t say “no” because you can’t bear letting someone down, then the problem is with your own sense of worth, not your problem with being irresponsible. It’s one thing to “flake” on someone and not come through after you promised something. It’s an entirely different (and better) thing to say “no” in the first place so you don’t over-commit yourself. You can say “no” when you know clearly whom your “yes” belongs to. Again, choose your “yes” carefully so you’re not saying “no” to those whom you love the most. Jesus practiced this. He ended up disappointing a lot of people so that He wouldn’t disappoint the One who was most important to Him…His Father in Heaven. In Mark 1 we read, “Very early in the morning, while it was still dark, Jesus got up, left the house and went off to a solitary place, where he prayed. Simon and his companions went to look for him,and when they found him, they exclaimed: ‘Everyone is looking for you!’ Jesus replied, ‘Let us go somewhere else—to the nearby villages—so I can preach there also. That is why I have come’” (verses 35-38). Jesus constantly communed with His Father and I believe that’s why He didn’t do all that was expected of Him by other people. Instead, He did only what God had led Him to do. Nothing more. Nothing less. That meant having to say “no.”Learn to say “no” so you can say “yes” when it really matters. While this trait can appear virtuous, it can also be the sign of a full-fledged people pleaser. Simply because something happens in your sphere of influence, doesn’t mean you are the one who is supposed to step in and fix it. Just because you are made aware of a situation doesn’t mean God is assigning it to you. And just because someone asks for your help doesn’t mean God is asking for it. Here’s some advice from my book Drama Free: When you discover someone is in need, stop, seek God’s guidance, and then stay out of it if God doesn’t give you a clear indication to step into it. When we fail to heed that instruction we can unknowingly interfere when God wants to do a special work in another person’s life. I think this one is the hardest to swallow. And I’ve found myself there many times. Are you afraid of disappointing another person more than you fear disappointing God? Do you crave another person’s positive reviews over God’s? The desire for the “praise of men” is one of the ways we exalt people above God…. Fear of man (and what he thinks of us) is such a part of our human fabric that we should check for a pulse if someone denies it. 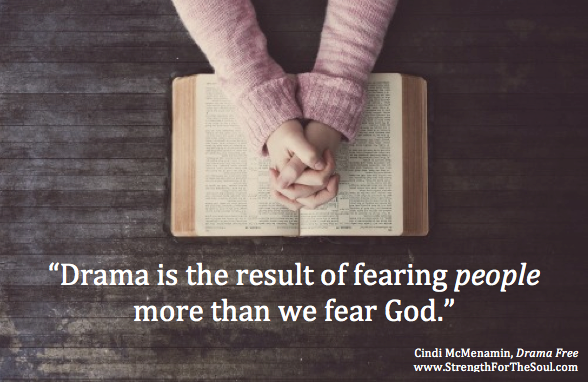 As I was writing Drama Free , it occurred to me that we, as women, create and experience drama because we fear people and not God. We care so deeply what others think of us rather than caring more about God’s opinion. The Bible tells us “The fear of theLord [not people] is the beginning of wisdom….” (Psalm 111:10, NASB). Fearing God – and His evaluation of our lives – gives us the wisdom to prioritize our time, squelch our need for approval, and stick to our God-given mission: to glorify God. If you find you are a people pleaser, you can easily become a recovering pleaser like myself. The first step is to fear disappointing God over anyone else. Second, prioritize the people in your life and choose carefully whom you must disappoint; and third, run your rescue attempts by God first, before you respond. Being a God-pleaser is so much more productive than being a people pleaser. Don’t miss out on my Summer Reading Sale with some of my titles (including Drama Free) as low as $5 each — only on my website through July 31, 2018.
on 4 Signs of a People Pleaser (And What to Do If You Are One). Wow Cindi, these are timely words of encouragement. Just what I needed. I was sitting in the middle of my living room floor thinking thoughts like you expressed here and I believe I got my answer. Thanks! So timely for me as well!! I stopped in the middle and text a “no”…thank you for always sharing your godly wisdom. Thanks, Connie, for sharing how it helped you. And thanks for realizing that your “no” means more time for your husband and your precious daughters. Wow what a timely message. I have to learn where am required to help and where God wants to work something out with a person undergoing a challenge. This is my weakness – hate to see people suffer. Thanks, Joyce, for your honesty. I believe we ALL suffer from people pleasing now and then. After all, we were created to be “helpers” according to Genesis 2:18. And sometimes it doesn’t feel within our nature to say “no” when someone else needs help.